Saluting the fourth annual International Sauvignon Blanc Day on May 17th, wine journalists all over the world have the opportunity to come out of the closet; to confess they do in fact drink sauvignon blanc and some may even admit to liking this overly-popular white grape variety. The Wandering Palate has already come clean on this some time ago, divulging a secret respect for the variety albeit in a very narrow spectrum of restrained style. If you are a ‘mood’ drinker like me, and sometimes it is the ‘mood before the food’, it takes a certain climate and summery temperature for me to warm to the notion of enjoying a crisp, racy, tantalizing tangy sauvignon blanc. That is to say, I’m not normally in the mood for a sauvignon blanc in the grip of winter, however living in Singapore right on the equator, its summer every day here; hot (and sticky) all the time and obviously this grape is well-suited to both the climate and cuisine. I do wish to be clear though, I am not a fan of the commercial sauvignon blanc style with its crowd-pleasing residual sugar and overt overripe flavours, which I believe adds to the misconception of the varieties better attributes. I also often hear comments that sauvignon blanc has no length and insufficient natural acidity to achieve any sort of greatness; to which I say, the sauvignon blancs that I drink are marked by their formidable intensity of acidity, exhilarating carry of flavour, persistent minerally farewell and are right up there in pedigree with many a riesling. The style of sauvignon blanc I personally enjoy generally has a lifted perfume and can exhibit such nuances as lemon citrus, grapefruit, pomelo, sour yellow plum, fresh cut apples, pears, gooseberry, pomegranate, quince and sometimes subtle sweet passion fruit, like the pulp smells when you cut them open. And there is often a certain musk quality to this perfume; an oleiferous emanation that has that subtle oily-herbal infusion that enhances the intrigue of a fragrance. There are elements of plants and herbs in the bouquet that add to the complexity and one can encounter such nuances as lemongrass, lemon thyme, lemon mint and many other mints and nettle, tarragon, sometimes a melange of crushed winter herbs, or horseradish, wasabi and fresh ginger spiciness that carries to the palate. Possibly the most fascinating attribute in the bouquet will be its pronounced notes of minerals with a tendency towards chalky, wet rock and limestone elements, sometimes enhanced by most attractive smoky, flinty-graphite redolence; but all these aspects discrete and an overall semblance of restraint. I like the palate to gush with piquancy and you should encounter a torrent of freshly squeezed lemon or freshly sliced green apple; there will often be a build up of the citrus repertoire to grapefruit, mandarin, sour yellow plums etc and there should be a mouth-watering juiciness to the wine and an intensity of flavours dancing on the palate; racy and accelerated by lively acidity and an intense carry of these succulent flavours across the palate to a crisp, dry, chalky, minerally and sometimes spicy (fresh ginger, white pepper, wasabi, horseradish) lingering farewell. Above all, I like leanness in sauvignon blanc; it needs to be tightly bound and full of tension and energy–it should invigorate the palate but at the same time show purity and restraint with a slippery, crisp and racy in texture. It is a style that is closely associated with Sancerre and Pouilly-Fume in the Loire Valley, France, perhaps the spiritual home of sauvignon blanc, but also this grape at home with the regions limestone marl soils. Admittedly, I have a preference for these regions however I also find there are equally enthralling sauvignon blancs from Austria, Italy, Australia and New Zealand. Yes, I know one should include South Africa, Chile and Argentina but I have limited experience of these countries wines and frankly I am not about to embark on a global exploration of sauvignon blanc–no thanks. Fresh seafood is another obvious partner to sauvignon blanc and the leaner styles are great with freshly-shucked oysters with a squeeze of lemon and cracked pepper. Whilst you can pretty much say sauvignon blanc will pair well with most grilled fish and shellfish, I think New Zealand Sauvignon Blanc hits its straps here with the brightness and clarity of fruit especially harmonious with fresh seafood and even more so with Asian spice and herb influenced dishes and curries with the succulence of fruit able to temper the spicy-heat. One of my favourite seafood dishes is Spaghetti Marina to which I have detail in an article on cooking this when holidaying in Melbourne and sourcing piping fresh seafood from the markets. I sometimes add finely chopped dill and lemon thyme to enhance the pairing of this dish – click here for recipe and article. Also, the best Spaghetti Marina in the world can be had in Melbourne, at Bacash restaurant in South Yarra, click here for article. Italian Sauvignon Blanc, from the Gorizia Hills or Collio and the hilly vineyards in northeast Italy bordering Slovenia, seems to be a perfect partner to sashimi and sushi; where a lot of sauvignons would overpower the delicacy of raw fish, the Collio wines are restrained and have a pleasant savouriness (Umami) and bitternut nuance that lends itself to Japanese cuisine. But let’s face it, most sauvignon blanc is consumed as a social lubricant, its drinkability, freshness and juiciness invigorates the palate; you don’t have think on the wine that much to enjoy it and that’s what drives its commercial success. I have my perennial favourites in this category–Neudorf, Mahi, and Shaw and Smith–all class acts that never fail to deliver (actually they over-deliver) in mouth-watering, delicious everyday drinking and should be bought in case-load quantities and a few well-chilled bottles always in the fridge. The global mass-market success of Marlborough Sauvignon Blanc has it downside in pigeonholing style and price sensitivity moreover making it very difficult for those smaller Marlborough artisan winemakers who must differentiate themselves from the industrial producers. In this regard, to my mind and palate, Seresin Estate has always been in a league of its own, consistently making a stunningly racy, taut, zesty, complex sauvignon blanc that simply outclasses all the rest. However, on my recent trip to Marlborough and up in up in the hills of the Waihopai Valley, I experienced another sauvignon blanc revelation, indeed without question the best sauvignon blanc I have tried this year and now my benchmark in all New Zealand–Churton Sauvignon Blanc 2011, a most enthralling, exhilaratingly, intensely flavoured, mineral infused, mouth-wateringly refreshing wine. Incidentally, both Churton and Seresin Estate are biodynamic practitioners and the vines dry-grown; surely proof of the benefits of organic and biodynamic viticulture. My most intriguing new discovery in sauvignon blanc is from Slovenia although actually made by one of Austria’s top sauvignon blanc producers, Tement. The Slovenian vineyard, named Domaine Ciringa, actually borders their single-vineyard Zieregg (in Austrian territory) with similar ancient limestone rich soils full of sea fossils, hence the name “Fosilni Breg, which means fossil mountain. Tement Sauvignon Blanc’s are about serious as it gets for this variety; mineral infused single-vineyard expressions that dare I say, are the Grand Cru equivalent to German Riesling and mature wonderfully well past a decade and more in bottle. Perhaps one of the most fascinating and little-known sauvignon blanc secrets in the world is Gembrook Hills, situated in the hills of the Yarra Valley with a vineyard amphitheatre that reminds me of the slops surrounding the village of Chavignol in Sancerre. For over 3 decades, Ian and June Marks and their winemaker since 2000, Timo Mayer, now joined by the Marks son, Andrew, have been making sauvignon blanc of unparalleled concentration and complexity, redolent in minerals and crush winter herbs, supremely elegant yet powerful and reaches its optimum with around 6 to 10 years in bottle. I enjoyed a 2003 recently at the vineyard, bottled under screwcap, which was drinking superbly and one of the most memorable Australian white wines I have experienced. So here is a selection of the Wandering Palate’s favourite sauvignon blancs with the emphasis on it being personal preferences; also below this are some tasting notes on the current vintages of these wines. And whilst we salute sauvignon blanc today, May 17th, I hope this piece inspires a thirst for the grape whenever the ‘mood’ or ‘food’ suits. Brilliant perfume, highly-expressive of grapefruit with hints of passion fruit and Tahitian lime, a very alluring musky-nettly-flinty complexity adds to the captivating bouquet which builds with air and reveals a subtle crème brûlée-like sweetness and lees character, there’s also a lifted spiciness with peppery notes of horseradish and a distinctive chalky minerality. Explodes in the mouth with piercing tangy lemon-grapefruit, the sort of intensity of freshly squeezed lemon juice, fantastic fruit carry across the palate, builds in fleshiness and takes on a silky, slippery seamless texture then accelerated by tangy racy acidity along with nettle, apple mints and thread of white pepper and wasabi-like spiciness, bracingly dry on the long farewell with an infusion of minerals and savoury chalkiness. Seriously impressive, complex and invigorating bone dry wine. We also tried in succession the 2010, 2009 and 2003 Churton Sauvignon Blancs with a thread of the intense grapefruit and subtle passion fruit consistent, also the musky quality was prevalent as was the structure and fruit intensity on the palate with the torrent of lemon/grapefruit and exhilarating energy and acidity, glassy smooth texture and savoury chalky, spicy wasabi-pickled ginger warmth farewell consistent in all the wines. The 2009 showed a little development and the and 2003 wonderfully rich with a custard like nuance and although at its peak an impressive effort for their first sauvignon blanc made and still holding together at 10 years old. 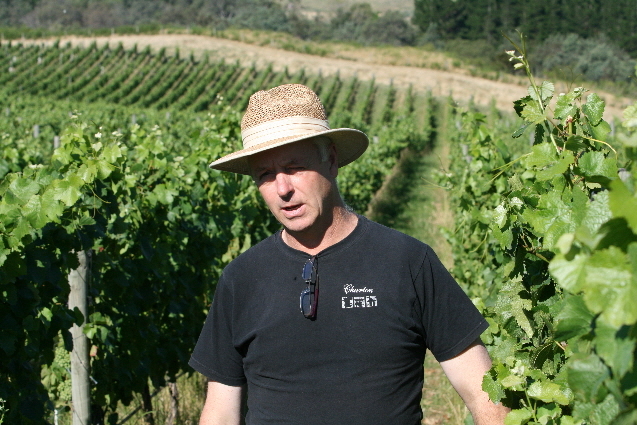 In a region that has a surfeit of prosaic sauvignon blanc and commercial complacency, Churton Sauvignon Blanc is a game-changer and not only lifts the bar on quality, it challenges the whole Marlborough establishment and representative of the small group of artisan produces driving the evolution of the region. Pronounced perfume of grapefruit, lime and lemon, hints of passion fruit, fresh and enticing scents with fruit as bright as the Nelson sunshine, background showing lemongrass and Laksa leaf white peppery spiciness and river stone minerality. The palate gushes with green apple and grapefruit tanginess, a real succulence and juiciness, mouth-filling and superbly textured yet with racy steeliness and minerality, wonderful poise and persistent citrus acidity and spiciness–firms up to a bone-dry and persistently tangy farewell. Consistently my favourite New Zealand sauvignon blanc and simply an utter to joy to drink, and I would go as far to say this wine is such great drink it would convert even the most obstinate sauvignon blanc sceptic. Intense perfume of lemon, lime-leaf, grapefruit and freshly cut granny smith apples, breaths out to sweeter peach and stone fruit nuances, floral clover fields and fresh garden peas shoots add to the complexity along with gravelly wet stone minerality and fresh ginger spiciness. Super-charged racy palate entry with stinging lemon-lime citrus and yet a silky and slippery excellent texture with a subtle phenolic savoury quality, great intensity and almost painful acidity which gives it the backbone and structure to age for many years. It is on the one hand, it is very approachable in its restrained and classy style and would be the perfect accompaniment to freshly-shucked oysters or sashimi, however it really is a wine that rewards cellaring and blossoms after 4 or more years in bottle; I personally think it is one of Australia’s most profound white wines, up there with Grosset Polish Hill Riesling. Wonderful perfume of warm custard and backed apples, vanilla pod, lemon meringue and a certain sweet/sourness in the perfume in a lemon tart way, subtle honey cone, buttered shortbread – fabulous bouquet really, incredibly complex and alluring. Beautifully slippery, viscous palate, really polished and softly textured and yet still racy and tangy, lemon-edged, minerally, straw, hay barn, dried wallflower, accelerates across the palate to a bone dry and chalky farewell and spicy ginger tailing. Incredible wine and flies in the face of the perception of sauvignon blanc ageing moreover, who would ever of thought an Australian example having so much pedigree. 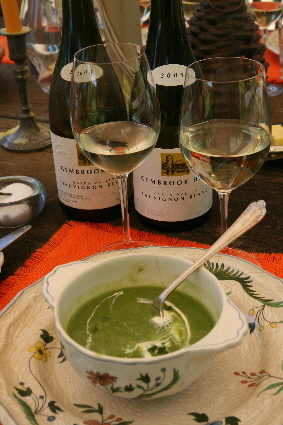 We the wine over lunch at the vineyard, June Marks serving up an amazing cold pea soup with the wine, on glorious summers day; perhaps my note influenced by all this but I was thinking if I was one of those wine writers that scored wine, I would have to give this 150 out 100. Subtle passion fruit, grapefruit and mandarin scents amongst zesty lemon and lemongrass, nettle and white pepper-fresh ginger spice –there’s a gentle nuance of crush winter herbs (thyme, lavender), like the scents of the Provence countryside in the winter, and lingering cool minerality. Zingy and mouth-watering palate entry with an explosion of intense lemon and grapefruit with a steely core of acidity, in the dependable Shaw & Smith style, it is taught and focused, racy with impressive carry and length of flavour, seamless in its gentle and slippery texture, impeccably balanced and I sense the more reserved bouquet and coiled energy indicating an excellent year for sauvignon blanc. As an observation in the South East Asian market, this wine arguably has a greater following than any Marlborough producer, indeed it is the default choice on a wine list for Dim Sum, Cantonese, Thai, Malaysian, Japanese etc, etc. Lifted perfume of pink grapefruit, kiwifruit and passion fruit quickly evolves to reveal a complex melange of citrus and more pungent fresh snow pea shoots, muskiness and crushed winter herbs with a tingly white pepper and fresh ginger spiciness–one can sense the coiled up energy in the bouquet. Intense palate entry, zingy and full of energy exploding on the palate with succulent citrus, green mango and lime, racy, invigorating, fleshy, incredible acidity and carry of the fruit, indelible, powerful, intensely spicy–really enjoy this sort of tension and spiciness in sauvignon blanc and the spice and citrus goes on and on with a minerally, chalky bone dry farewell–if only more sauvignon blancs were like this. Lifted perfume of lemon and fresh cut green apple, exudes a classy restraint, pure and pristine yet intense in its bouquet, deeper scents of grapefruit, quince paste, pomegranate and an alluring oleiferous musky quality with further complexities of nettle, lemon mint, smashed river rocks, infused minerals. A torrent of mouth-watering lemon engulfs the senses, exhilarating power and intensity as the wine rushes across the palate and yet seamless and glassy-smooth in its carry as it glides across through the mouth with powerful lemony, razor sharp acidity piercing the gills accentuating its leanness and length, chalky, graphite minerally farewell with a lingering saltiness and fresh ginger spiciness. Exudes the pedigree of old vines and ancient limestone marls. I could drink this wine all day, just keep the fresh oysters coming. Big whiff of gooseberry, yellow plum, ripe pears and sweet passion fruit pulp, sherbet-like, musky perfume, wet stone flintiness, wet clay, almond skin, background of pungent papaya and herbal winter garden, lemon thyme. Juicy lemon and fresh cut apples, edgy, crisp and racy with palate staining citrus-lemon-grapefruit, sour yellow plum merges with a chalky, flinty mineral infusion, thoroughly invigorating wine, almost inconceivable that a sauvignon blanc could have so much power and intense flavour. Sauvignon blanc benchmark for me–globally.